The energy industry is increasingly interested in carbon capture and use (CCU) as an alternative to carbon capture and storage (CCS), writes David Hone, Chief Climate Change Advisor at Royal Dutch Shell. But according to Hone, these are two quite different processes, and work still needs to be done to establish the climate credentials of CCU. Recently I attended a meeting of major industrial emitters and the discussion moved on to the subject of carbon capture. This shouldn’t have come as a surprise, but one aspect of it did; the context was entirely carbon capture and use (CCU) rather than carbon capture and storage (CCS). One participant did mention CCS, but corrected himself to CCU. These are two very different approaches to managing atmospheric carbon dioxide and don’t behave in the same way or necessarily give the same outcome. CCS for industrial processes involves geological storage of the carbon dioxide, typically 2-3 km below the surface. The Shell Quest facility in Canada operates in this way. This removes carbon from the biosphere and returns it to the geosphere such that it has no impact on atmospheric carbon dioxide concentration or ocean acidity. It is the basis of a permanent solution to elevated carbon levels in the atmosphere and effectively replicates in a very short space of time what nature would otherwise do over hundreds or thousands of years. Most climate models show that even when a rapid reduction in fossil fuel use is assumed, society will likely still require large scale storage of carbon to limit warming to 1.5°C and probably for the 2°C case as well. Carbon capture and use operates in a very different way. There are examples in practice today or in the pipeline, including the use of carbon dioxide for enhanced oil recovery (EOR), the conversion of carbon dioxide to certain chemicals (e.g. urea) and the production of materials such as polycarbonates. These processes all require carbon dioxide to operate, but are not necessarily designed to store the carbon dioxide permanently (although in most cases this is what happens with EOR). If the carbon is returned to the atmosphere, such as through the degradation of the compound that is made, then the overall impact of the process may be zero in terms of atmospheric carbon dioxide levels. However, the impact may be delayed for quite some time, possibly stretching into hundreds of years. CCU may therefore solve a local carbon dioxide emission issue, but does not necessarily address the bigger question of climate change. There are two ways in which CCU could become effective. CCU might be used to manufacture synthetic hydrocarbon fuels, which could displace the need to extract fossil hydrocarbons. However, the synthetic fuels industry would have to scale very significantly before it could be claimed that this was indeed a reduction. Further, as is always the issue with mitigation analysis, it is even more difficult to claim that the total fossil resource extracted over time diminishes. There is always the possibility that the same amount is eventually extracted, but over a longer period. CCU could be applied to the manufacture of certain goods, for example building materials. But to act as a mitigation mechanism akin to CCS, CCU has to lead to storage. This would be accomplished by increasing the total stock of the material in use at any one time. Say for example that homes are built with the new material. The starting point would be zero, but in a decade or so there might be 50 million homes constructed. Even if the homes are eventually torn down (and the carbon released), so long as the total number of such homes in use continues to increase, then more and more carbon is stored. The issue here is that the total stock has to be maintained for a very long time (at least a century or more) for CCU to approach CCS equivalence. As populations grow and development proceeds, the stock of all goods in circulation has generally increased, even as old items are removed and new ones added. We have more buildings than ever before, more stuff in the buildings and more machines such as cars, ships and planes. All of these could be potential carbon stocks for century long storage. But we will need to be aware of the corollary, i.e. winding down the global stock of a certain item will result in the stored carbon being returned to the atmosphere. 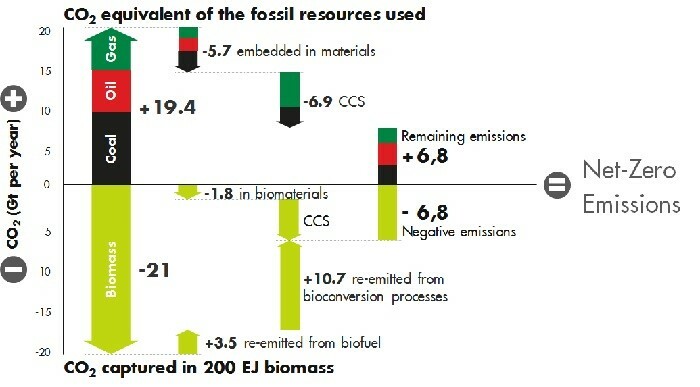 In the recent Shell publication, A Better Life with a Healthy Planet, Pathways to Net Zero Emissions, the net zero outcome made use of both CCU and CCS, as shown in the chart below. This is a scenario for later in the century so it is important to recognise that not all the technologies are sufficiently developed to fully deliver this. For example, air capture of carbon dioxide is still at pilot-plant stage. Nevertheless, in the scenario the on-going use of some fossil fuels in certain applications is balanced by geological storage of carbon dioxide and embedding carbon in materials, with the assumption that the stock of that material in circulation globally increases over time. This means that accounting plays a critical role. Assigning a mitigation value to CCS is a relatively simple task; each tonne stored can be counted as permanent mitigation and will contribute to the overall task of reaching net zero emissions. The same cannot be said for CCU yet. While it is clear that carbon can be embedded in urea or polycarbonates, there is no established protocol to define this as permanent mitigation. Work remains to be done in this field. David Hone is Chief Climate Change Advisor for Royal Dutch Shell. He combines his work with his responsibilities as a board member of the International Emissions Trading Association (IETA) and Centre for Climate and Energy Solutions (C2ES). This article was first published on his blog Shell Climate Change under the title Carbon Storage or Use?, and is republished here with permission from the author. Why don’t you first read the article before you decide whether to believe the author or not? What has the climate film got to do with this? The climate film did NOT show they knew about the dangers and did nothing – it showed they knew about the dangers, period. The film has not been “uncovered”, it was shown by Shell in schools across the world. It’s true that Shell as a company then pursued a strategy that in many ways went against the findings in the film. But that has nothing to do with David Hone’s views on CCS and CCU. In fact, you even seem to miss the point that he is critical of CCU! If he was not, you might say, oh, he is not because he is from Shell. So your comment does not make sense at all. Shell nevertheless realized that solar technologies could never attain the scale required to supersede coal usage for limiting global warming. Substitution by natural gas in power generation therefore became the dominant approach pursued by the company toward that objective. Any assessment of all CO2 emissions subsequently avoided would have to acknowledge Shell as being a significant part of that accomplishment. 1. Invoking CCS and CCU to compensate FF-fired generation at the present level has nothing to do with reality (I am not claiming that Mr. Hone is doing this, but it has been a persistent theme from the FF industry). This doesn’t mean that we should not experiment with sequestration. 2. In the short term, replacing coal with efficiency, renewables and gas, as appropriate, is a fantastically more efficient means of CO2 reduction, especially in the presence of overcapacity. 3. Synthetic fuels (for example for transportation and heating) are problematic because, recycling the carbon once, they achieve at best a factor of 2 reduction in carbon intensity (and actually considerably less). So for deep decarbonization they must be used very selectively and can’t account for a large contribution to the energy economy (air capture is not a solution for now). I conjecture that it is more efficient to spend resources on rapid elimination of coal and oil use than on building up large scale CCS/CCU infrastructure to compensate it in the mid-term. Maybe the model can show that this is wrong. CCS/CCU research and pilots should be supported in any case. The essential issues, when and how much, are not discussed in this article. If they were considered, there may be little difference between CCS and CCU. It is a simply a matter of time, between the atmospheric isolation of the CO2 emissions from combustion, in a geological strata or in a landfill. Is that time delay meaningful? And how much will it cost? There is little hard information but all indications predict both are very expensive for the full scale industrial, grid scale, build-out a survival need, energy. These two issues, when and how much, bedevil the carbon-climate change technical debate. BTW, we do have solutions for capturing CO2 out of the air: plants. Wonderful nano tech; self-repairing and self-replicating. Bu they do require space and water. Does anyone out there know anything about the balance of mass and energy it takes to do CCS? 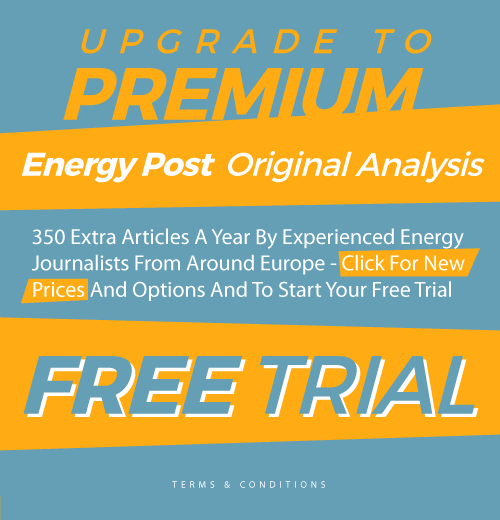 In my CCS article published by Energy Post on June 6, 2013, I calculated that the IEA requirement for equipping 3,400 power plants and industrial facilities with CCS amounted to one new CO2-free plant or factory built every two days until 2030. Any delay would allow the 2 degree global warming limit to be exceeded. Four years later, no initiatives of the required scale have yet been launched. The number of needed CO2 capture installations, however, has now risen to 4,000. There are only 5,048 days remaining until the end of 2030, and just 3,497 workdays. Carbon capture and use would present immense logistical challenges. In a simple case, converting calcium oxide (which is not easy to find in its natural state) and carbon dioxide to carbon carbonate delivers a solid product with atomic weight 80. In Germany, the lignite burned annually to generate electricity would therefore result in 306 Mt of CaCO3. That is ten times the output of the German cement industry, and equivalent to three Empire State Buildings per day. Perhaps this mountain of material could be shaped to form new pumped storage power plants, but the cost efficiency appears questionable. The world’s most modern CCS power plant at Kemper County, Mississippi, will soon be entering service. Despite all criticism over its final price of $7.1 billion, it nonetheless demonstrates the extent to which CO2 utilization might be employed. The plant is capable of delivering carbon dioxide for enhanced oil recovery, while its lignite gasification process includes the means of manufacturing fertilizers and sulphuric acid. The fact that many more plants of this type will likely not be built is not primarily the consequence of high chemical synthesis costs, but instead of markets oversupplied with naturally available products. I’ve never heard of naturally occurring calcium oxide. I’ve always thought you’d get it from the calcination of calcium carbonate. Anyway, it doesn’t seem to make any sense balance of energy-wise speaking. As well as balance of mass-wise. Better leave FFs in the ground. Because the overall balance of energy could easily go negative. I cited that example only as a thought experiment to illustrate the mass relationships involved. Since calcium oxide reacts with water, it is not found naturally except perhaps in perpetually dry formations in the Atacama Desert. However, the abundant mineral peridotite reacts with CO2 to produce carbonate-like limestone or marble. The slow natural process could reportedly be accelerated by hydraulic fracturing. Such proposals prevailed widely a decade ago. Today there is no prospect of their being implemented more effectively than numerous alternative technological approaches already at hand. As far as I can see, by far away the most developed CCU technology is in the use of CO2 in EOR. Using CO2 to increase oil production doesn’t seem at first sight a way to go in reducing CO2 levels, but it could be if the amount of CO2 that gets buried is a lot more than that emitted when the extra oil is burned. It would be interesting to know what the balance is. So, unless proponents of CCS can show clearly which technologies and how the balances of mass and energy add up and provide a ballpark figure about the costs involved, CCS should be, at best, considered as a dangerous distraction and at worst as a scam. Better leave it off the table and concentrate on sources of energy that don’t make CO2 as a by-product. Agnotology proposed by well-paid idiots in business suits on a flashing screen should be completely thrown into the garbage can when it comes to discussing such a serious and existential issue as climate change. Agnotology has already caused Donald Trump and Brexit. Shouldn’t it already be enough?